Mainstream geology has long dismissed the idea that the earth was once subjected to a global flood that cataclysmically annihilated all land-dwelling, air-breathing life except for a remnant preserved in the Ark. In 1961, however, Drs. Henry Morris and John Whitcomb published The Genesis Flood, which examined the evidence and concluded that it affirms the accuracy and authority of the biblical account. Since that time, studies have continually confirmed that the geologic record aligns with the Bible’s depiction of an earth-destroying flood. Thus, as the Flood’s globe-enveloping waters drained off the face of the earth, they were somehow “returning” to where they had originated, both the “fountains of the great deep” (Genesis 7:11) and the ocean basins. The next two Hebrew words, halôkh vashûbh, provide a verbal picture of the draining waters swaying in a rhythmic mega-wave movement. Although the King James Version translates this two-word phrase with the one word “continually,” the Hebrew phrase contains more information than that. The Hebrew wording connotes the water motion as being “continual,” yet it also denotes a directional movement that matches the English phrases “to and fro” and “back and forth.” Specifically, the phrase halôkh vashûbh is a linkage of two Hebrew verb participles**, one derived from the verb halak and the other derived from the verb shûb. What does it mean that the waters were halak-ing and shûb-ing? The answer to that question can be found by determining the basic meaning of the two root verbs, halak and shûb. Young’s indicates that the Hebrew verb shûb is most typically translated as “return again” (369x qal), “come again” (43x qal), “turn again” (40x qal), “bring again” (66x hiphil), and similar words that indicate a returning directional movement (page 47).1 Because both Hebrew verbs (halak and shûb) are participles**, their combined action is a continuing action—the waters are continually going and returning. Thus, as the floodwaters were abating (i.e., draining), they were also continuing to move in a repetitive (perhaps rhythmic or wave-like) manner, going back and forth, to and fro, like the tides of the ocean. A repetitive back-and-forth movement of floodwaters is the rock-solid evidence we observe in the geologic record of the Flood. The sedimentary rocks and fossils left in the floodwaters’ wake contain abundant evidence of the ocean-waters transgressing over the continents and then regressing back into the ocean. In fact, geologists have identified at least six separate worldwide “transgression” and “regression” sequences called “megasequences” preserved in the rock record. 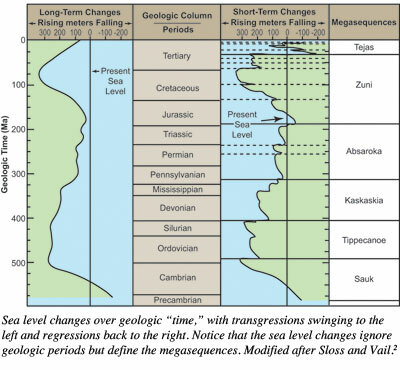 The accompanying chart references the standard concept of geologic “time,” with the long-ago past at the bottom and the present at the top, with individual periods noted. This is thought to represent the period of time that complex life has existed on earth. Note that during the latter part of the Zuni Megasequence, the ocean level rapidly oscillated, yet it was “coming and going” throughout all periods. Of course, recognizing that old-earth scenarios are hopelessly flawed,3,4 we would certainly disagree with the chart’s long time span of 600 million years, preferring instead to interpret the whole as the record of the great Flood of Noah’s day. Moving upward, we see the bottom as the early Flood period, then the mid-Flood, the waning stages of the Flood, and the post-Flood time at the top. The Genesis 8:3 grounding occurred during the later Zuni, when floodwaters were at their maximum and then began to wane. Within the rising and maintaining Flood portions of the chart is where geologists have seen these six (maybe subdivided into more) megasequences. During the final drainage, the waters came and went with greater frequency. Each of these sequences begins with a record of violent incursion of the ocean over the land, first depositing a basal coarse sand, then smaller grains, and then chemical precipitation as the energy levels lessened, ending with the water rushing back seaward with a mighty erosion episode. Each transgression landward followed each regression seaward in a continuous cycle of floods, until all was totally destroyed. These were not separate floods but one unimaginable super-flood, with repeated pulses of terror. In the beginning, God created everything “very good,” with man as God’s caretaker over His creation (Genesis 1:26-31). Tragically, it wasn’t long before man fully rejected the Creator’s authority and chose to disobey. But disobedience is sin, and “the wages of sin is death” (Romans 6:23), and from that point forward all things began to die. Before long, sin dominated the earth to such an extent that the Creator decided to destroy sinful man and the tainted creation and start again with a remnant who would be spared. The primary purpose of the Flood was judgment of sin and its terrible effects. Scripture doesn’t give us all the details of the Flood events, but geology can “fill in the blanks.” Remember, God’s primary purpose for the great Flood was total annihilation of the continents and the life they held (Genesis 6:7). The Flood involved much more than water flooding the land, standing above the mountains for a while, and then draining. Moving water contains much energy, while standing water does little work. God promised He was going to destroy the wicked, violent inhabitants of earth along with the earth, and super-powered cleansing floodwaters—washing “back and forth” across the land—appear to be the tool God chose to accomplish it. Young, R. 1980. Young’s Analytical Concordance to the Bible. Peabody, MA: Hendrickson Publishers. Sloss, L. L. 1963. Sequences in the cratonic interior of North America. Geologic Society of America Bulletin. 74: 93-114; Vail, P. R. and R. M. Mitchum, Jr. 1979. Global cycles of relative changes of sea level from seismic stratigraphy. American Association of Petroleum Geologists Memoir 29, 469-472. Morris, H. M. and J. C. Whitcomb. 1961. The Genesis Flood: The Biblical Record and Its Scientific Implications. Phillipsburg, NJ: Presbyterian and Reformed Publishing Company; Morris, J. 2007. The Young Earth, revised ed. Green Forest, AR: Master Books. Johnson, J. J. S. 2008. How Young Is the Earth? Applying Simple Math to Data Provided in Genesis. Acts & Facts. 37 (10): 4-5. ** Technically, these are infinitives that function as participles denoting durative action. * Dr. Morris is President and Dr. Johnson is Associate Professor of Apologetics and Chief Academic Officer at the Institute for Creation Research. Cite this article: Morris, J. and J. J. S. Johnson. 2012. The Draining Floodwaters: Geologic Evidence Reflects the Genesis Text. Acts & Facts. 41 (1): 12-13.